WebDemo, from SpartaCom, is a beautifully simple software solution for collaborating over the Web. Requiring only a Web browser and a computer connected to the Internet, participants from multiple sites can communicate visual information combined with simultaneous live voice communication. The host’s console has six icons and fits in a small window that can be positioned anywhere on the host’s screen. From there, the host can set up the “viewport”—a window that can be positioned anywhere on the screen, and can be resized at any time by clicking and dragging. Anything the host positions within the viewport window is broadcast to the other participants—anything left on the desktop is not broadcast. Participants can share PowerPoint slideshows, explain CAD/CAM diagrams, co-browse live Web pages, or share virtually anything that can be shown on a computer screen. This extreme flexibility is possible because the actual visual information shared is an image of the viewport window. 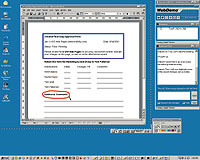 It is not necessary that the shared applications reside on other participants’ computers. But the image in the viewport is more than just a live picture of the host’s computer screen. The host can transfer control of what is in the viewport to participants, allowing users to open programs, type text, insert or delete objects, and modify what is on the host’s screen within the viewport. This means that remote users can add or modify PowerPoint slides, work on CAD/CAM diagrams, or edit word processing documents, among other things. One of the six icons mentioned earlier allows the host to view lists of participants and their connection information, including screen resolutions and connection speeds, so that hosts can adjust their presentations to meet the limitations of participants’ connections. The host can actually see when each participant’s data transfer is complete, and know when the participant can see the entire visual. The host can also transfer hosting rights—including viewport—to any-one on the attendee list. The host can grant and revoke remote control of viewport content at any time. WebDemo allows both one-way and two-way voice communication. The host has access to full-duplex voice chat—allowing simultaneous talking and listening. Participants have access to half-duplex voice chat, allowing each to either talk or listen, but not both at the same time. Because current voice-over-Internet technology presents some lag problems with two-way voice communication, a phone conference call may prove more workable in some situations. If two-way voice communication is not required, however, voice-over-Internet works well for one-way broadcast, and keyboard chat provides satisfactory two-way communication. The WebDemo host can enable keyboard chat for all or selected participants, and each can “raise a hand” by right-clicking in the chat window. The host is then alerted by a flashing username in his or her own chat window. Ideal for help-desk use, WebDemo lets technicians view a user’s screen (with the user’s permission) rather than rely upon verbal descriptions. Technicians can diagnose problems by remotely taking control of a user’s desktop, allowing technicians to serve greater numbers of staff or students. WebDemo also provides opportunities for training and development: Users can learn a great deal when technicians assume control of their desktops and demonstrate solutions and workarounds. As a presentation or demonstration tool, WebDemo allows instructors to share visuals and talk about the images at the same time. Whiteboard tools let the host mark on the visuals, circling key elements, enumerating points, and highlighting ideas. Students can ask questions using either voice or keyboard chat. WebDemo requires very little bandwidth since the actual data exchange is facilitated through a Java script. It can function with a 28.8 dial-up modem connection, but runs best with a high-speed Internet connection. WebDemo is available as either a server product or as a hosted solution. The server product pricing is based upon concurrent users and is probably beyond the means of most individual faculty, but may be within the means of individual departments. The hosted product pricing is an annual license and is based on concurrent users. It is more likely within the reach of individual faculty members, and is likely within the means of most departments. Licenses are based upon concurrent users rather than set user login accounts, providing flexibility for departments wishing to allow different professors to use WebDemo with different sets of students at different times, up to the concurrent user limit. This type of license also works well for help-desk use: Technicians can help as many users as the concurrent user limit allows.